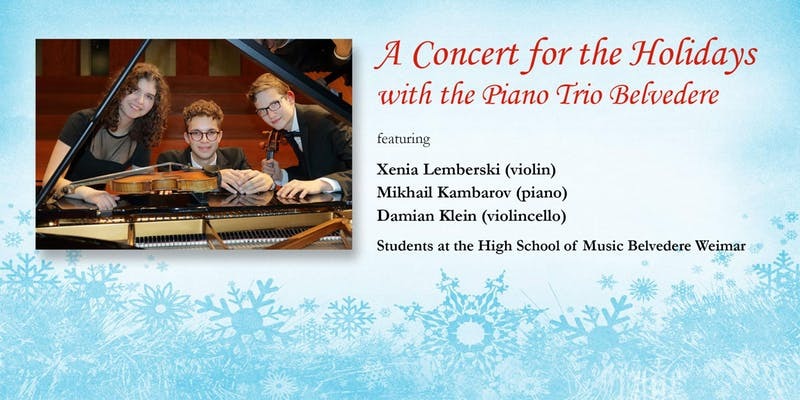 Join us at the German Embassy Washington for a seasonal concert performance by the Piano Trio Belvedere, comprised of students of the High School of Music Belvedere Weimar. Located in central Germany in the state of Thuringia, the selective High School of Music Belvedere educates 120 talented young musicians starting in the fifth grade. Students have the chance to receive a comprehensive musical scholarship from the affiliated University of Music FRANZ LISZT Weimar. The Piano Trio Belvedere will perform works by Bach, Beethoven, Chopin and Shostakovich, among others. Following the program, join our reception with the young artists and seasonal refreshments.